I’ve been creating a number of spiritual-based online courses and wanted to share how best to structure these sensitive pieces and the essential key elements to help students transform. A spiritual course cannot be created like a regular course that has a number of units or modules with worksheets, etc. For a spiritual course, there needs to be ample emotional learning. In the educational world, this is called Affective Learning as it affects the heart. It is argued that we cannot highly value or embrace a way of being if we are not given the time to evolve towards it. Below is a natural progression of how we develop our feelings, attitudes, values, perspectives, appreciations and motivations. 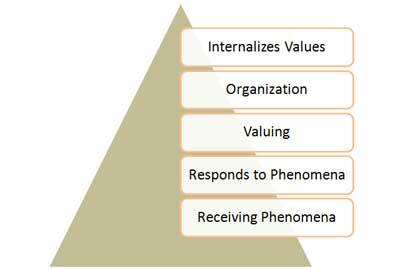 Internalize: Fully embracing a new value to alter behaviours. As you can see, lessons, exercises and the expectations of students needs to be step-by-step or we will lose them quickly. It needs to be a slow and intentional process as we cannot force people to feel anything. It is hoped that students taking a course on mindfulness will internalize, or at least organize their lives around, using this intentional way of attending to all. That is, they would become more mindful of what they do and choose that is based on values they have developed or grounded within themselves. But, we cannot expect this to happen immediately – or even during our course. However, we can create a learning path that has them learn, try and test a new mannerism or mode of living – with special support along the way. The heart needs time to catch up to the brain with emotional learning. I strongly believe you cannot effectively deliver a spiritual or transformational course without being involved and facilitating it with great care. Too many people are promoting how to build courses to earn tens of thousands of dollars. I am not disagreeing with the potential earning power of e-courses but sensitive, soulful courses need you to be involved and care for your students. Your students need this experience versus a self-study course. WARNING: Many course marketers are not educators and mostly offer cookie-cutter methods to train others through online courses (notice the word, train.). They do not offer a variety of ways to design learning for individual genres or topics (i.e. fitness course). I am sure you have experienced not feeling safe at times in your own life. Perhaps, you were in a support group (offline or online) and did not feel confident to divulge personal feelings or stories. There was something about the group or how it was structured or facilitated that left you a bit cold. Therefore, take time in the initial weeks to build trust with and amongst everyone. Set the tone, lay down the rules and provide netiquette guidelines (how to communicate politely online) to create a safe learning environment. Also, consider where you will be communicating. I recently heard of participants in a closed Facebook group were taking screenshots of postings and shared them publicly. How horrifying! Some solutions might be communicating in third party discussion boards (i.e. Slack or Google Group) that give the impression of a very private group away from social media. If you are interested in designing and developing a course based on true & tried educational principles that takes your students down a unique and responsive learning path consider my E-Course Blueprint tutorial. In this tutorial, I provide you with 4 key lessons that helps you to design affective, transformational, holistic, experiential or cognitive-based courses. I also encourage you to combine some of these theoretical approaches. Please know, I have boiled down my education and course design experience into simple but rich steps to help you build something that does not feel too light, incomplete or cookie-cutterish. I design about 50 course blueprints a year and each represents such a beautiful course. You can have this, too. If you prefer that I design a course blueprint for you, see my STAGE 1 service for Your Custom Crafted E-Course.